At first glance I'm sure many of you wonder how TeaVivre fits in with my two weeks of all things French since they're based in China, but according to their about me page they're made up of "a group of tea lovers and aficionados from China, Canada and France." Looks like they fit in perfectly! Since today is National Iced Tea Day I thought I would do a side by side comparison of the three different varieties of Yunnan Dian Hong Black Tea that they offer. It's the perfect black tea to use for iced tea and I've been curious to see which of the three comes out on top. First off I should probably let you in on a little secret, there is more than one way to make iced tea. It seems that everyone I've come across has a different method that they prefer and even I have more than one way of making it depending on how much time I have. Generally I prefer to steep my tea leaves several times, mix the multiple steeps together in a big pitcher, and let it cool in the fridge only adding ice when I'm ready to serve my tea. This keeps the ice from melting and watering everything down before I'm ready to serve it. For the sake of this review I've steeped my tea for 3m, 4m, and 5m and mixed the separate steeps together. Our Dian Hong black tea from Yunnan is a mix of about 1 quarter golden pekoe buds and 3 quarters dark leaves, and is still a high quality tea that is great to drink. When brewed it is similar in taste to our other two Dian Hong teas, but with slightly less intensity in flavour and aroma. Can be drunk as-is, or with a touch of sugar or milk. This was my least favorite of the Dian Hong teas I sampled, although that doesn’t mean it’s a bad tea. The malt notes were much stronger than in the other teas and it was the most astringent of the three. It is definitely a bold tea, which is what I look for in a black tea I plan on drinking hot, but I don’t think it’s the best option for iced tea. It tends to leave me with a dry mouth, something I want to avoid with my iced tea since I’m likely drinking it on a hot summer day when I’m already feeling parched. Normally I don’t talk about price in my reviews, but I did want to mention that this was the most economical of the three teas I sampled costing roughly $2.50 per ounce. Would I order this again? Probably not. While this was a perfectly serviceable black tea, I prefer either the full leaf or golden tip for iced tea. Of the three Dian Hong teas that I sampled, the golden tip ended up being my favorite. It had a much more mellow flavor than the others. Unlike the first tea I reviewed, this Dian Hong lacked the strong astringency that I disliked and the malty flavor was much more subdued. It also had rich notes of cocoa and honey that gave it a subtle sweetness, making it perfect for iced tea. Would I order this again? Yes! This is exactly what I'm looking for in a Yunnan Dian Hong Black Tea, it makes an excellent iced the that is naturally sweet, but also takes to sugar well. 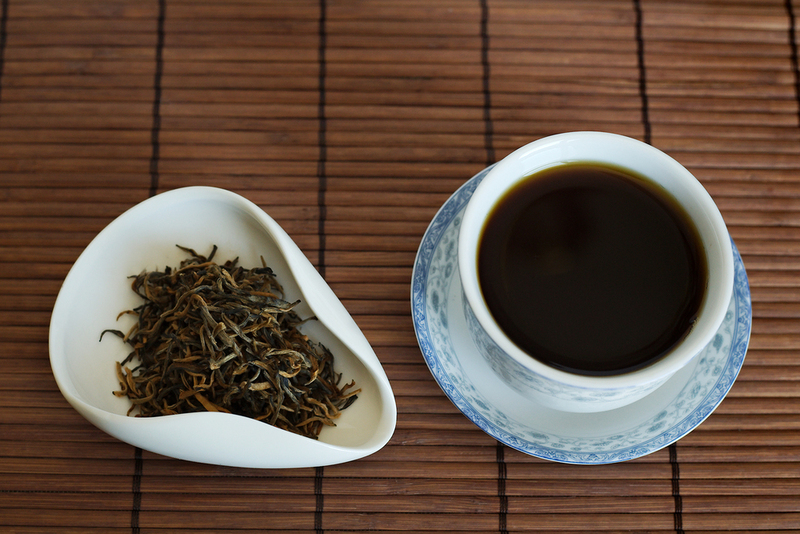 A classic Chinese black tea Dian Hong from Yunnan. This tea is about half golden “pekoe” colored buds and about half black mahogany colored leaves, When brewed it makes a highly aromatic black tea, with a rich, bold taste with no bitterness. Can be drunk as-is, or with a touch of sugar or milk. This tea is much more bold than the golden tips, but not nearly as much as the standard Dian Hong; it’s the perfect balance. It has some of the honey and cocoa notes that I enjoyed from the golden tips, but they aren’t nearly as pronounced. Instead the malt flavor stands out a bit more, so if you like a heartier tea, this may end up being a good choice for you. The only reason that this tea didn’t come in first place was because I tend to look for a slightly more sweet tea when I make my iced tea. If I were planning on drinking this hot, this would definitely be my first choice. The bold flavor is perfect for getting me going in the morning and as everyone knows, I can use all the help I can get. Would I order this again? Yes! While this isn't my first choice for an iced tea, it is exactly what I look for in a hot tea. In an effort to be open with my readers I want to let you know that these samples were provided to me free of charge by TeaVivre for my review. As always, all opinions are my own.